A demostration of the Thermite firefighting robot. All photos: courtesy of Howe and Howe Technologies Inc. Imagine if you saw a pimped-up and remote-controlled mini tank zooming to extinguish a flaming wreck. You’d be forgiven for thinking it was the beginnings of a B-rate sci-fi movie. But within just a couple of months, robots like these will be deployed to fight fires in the U.S. At least, that’s the hope of Maine-based manufacturers Howe and Howe Technologies. The technology is supposed to reduce the exposure of human firefighters to extreme fires, the kind with additional complexities such as fuel explosions, chemical leaks, and nuclear meltdowns. The introduction of robots into firefighting comes after their use in other high-risk occupations such as SWAT teams, and as such it’s almost surprising that it hasn’t already happened in the firefighting field, says Mike Howe, who co-owns the business with his twin brother. You might also know them from their Discovery TV show, Black Ops Brothers. “We’ve had all this robotic technology but nobody said, ‘What about the firefighters?’” he tells Danger Room. Howe and Howe Technologies offer a suite of firefighting and emergency robots; the “Guardian” with its robotic arm helps to move debris, the “Terra Maxa” clears the way with its plough, and the “Thermite” has a multidirectional nozzle that sprays as much as 600 gallons of water every minute. These robots are delivered to the scene on the back a huge truck called the “Bulldog,” which is the only non-robotic component of the package and also acts as the Thermite’s water source. Howe and his brother developed the robots over a period of three months or so with a small grant of about $30,000 from the U.S. Department of Homeland Security’s “technology foraging“ initiative (.pdf), which actively seeks out gear that can rapidly be turned into something useful for the first-responder set. The program has also invested in 3D-printing projects and methods for tracking small boats. Just two weeks ago, Howe and Howe started selling their firebots to the public and the government. For the moment, they feel confident that they’ve identified a previously untapped part of the robotics market, but they don’t think it’ll remain like that for long. “I know it’s a market that’s going to flood in a couple of years…. I’ll bet my company on it,” says Howe. They see their robots fighting the kind of fires that unexpectedly ball out of control or when there might be an explosion at any minute; airplane fires, derailed trains, chemical fires – the kind of fire that no human should be near, professional or not. Howe says that he gets a lot of people telling him that these robots shouldn’t replace humans. He says that they won’t and that they’re “just another tool in the firefighter’s belt.” For one thing, someone has to control the robot, but the idea is that the robots will bring the situation under control, which then allows the firefighter to approach the area and rescue victims or continue to put out the fire. But what’s likely to get fire chiefs really excited? 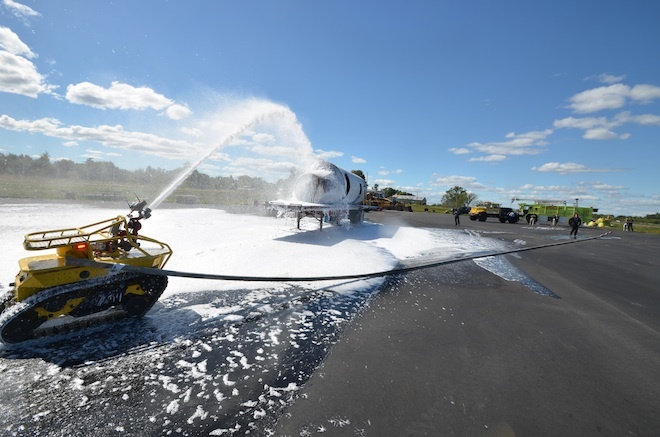 Cost – as in they don’t cost much (compared to conventional firefighting technology). A fire truck costs something in the region of $800,000. If a fire department wanted to buy a Bulldog and two robots, a Thermite and a Guardian, say, it would cost about $400,000. Additionally, Howe hopes to drive the day-to-day insurance costs of a municipal fire department down. Insurance companies assess risk and price accordingly. Howes’ robots are risk-reducing machines, which Howe says will not only save lives, but also insurance premiums. Howe and Howe’s machines aren’t the first time the government has looked to robots for help with putting out fires. The Navy created Octavia, a more lifelike, human replica of a robot, which uses modified Segway wheels to get around. But the Thermite’s all terrain credentials make it much more likely to be used outside the test lab.